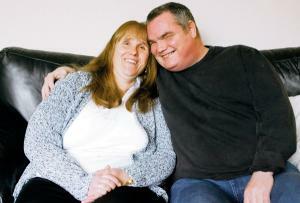 Melanie Henderson lives with her fiance Trevor in Trimdon Station, and is due to be married on 17th July 2010. Nothing unusual about that, you may think, until you find they are both totally blind. They first met on a website for blind people almost two years ago. Melanie became blind at 21 years old, having known her eyesight was failing but not expecting to be totally blind at such a young age. Further problems led to her eyes being surgically removed to alleviate pain. This in turn left her with epilepsy, which fortunately is controlled by medication. She had two sons at the time, but their father could not cope with Melanie’s loss of sight, leaving her to bring up the children herself. A difficult situation for anyone, harder still for someone with a severe disability, but Melanie is now proud Mum to two young men aged 18 and 21 years. Only her Mum stayed in touch, as sadly even her two sisters and brother found it easier to stay away. Losing your sight is a major challenge, with simple tasks becoming a huge obstacle to overcome. Learning to cook, wash, shopping, sorting clothes out into the right colours etc., all the everyday tasks had to be relearned. Melanie hadn’t at first realised how losing a major sense could change your life, but says she has achieved so much more since since then – what the eyes don’t see you make up for with other senses. Trevor, a talented musician, lost his sight when he was just five, and lived in Trimdon Station when he met Melanie. Travelling to meet each other meant a trip of 130 miles, which is quite a distance for anyone, but all the more stressful when blind. These to-and-fro expeditions lasted for six months, until Trevor had to move to Hull to help care for Melanie. When Melanie was well enough, they decided to return to Trev’s native Trimdon. Melanie and Trevor are to be married on Saturday July 17th 2010 at Peterlee Registry Office, then are having their wedding reception at the Welfare (Community Centre) in Trimdon Station.